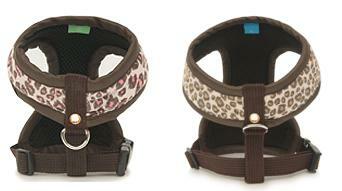 This Puppy Angel Charming Leopard Soft Harness and Leash Set is a funky way to walk your pooch! Made from glittery leopard-printed fabric the edges are trimmed in chocolate brown binding while the mesh lining ensures the ultimate in walking comfort. The chest is adjustable and the strong strap down the back holds the D-ring for attachment of the tangle -free leash which is included. There is a cute crystal locket hanging from the bow on the chest and a darling rhinestone above the d-ring on the back.